The colonial government of southern Nigeria began to use asylums to confine the allegedly insane in 1906. These asylums were administered by the British but confined Africans. Yet, as even many in the government recognized, insanity is a condition that shows cultural variation. Who decided the inmates were insane and how? This sophisticated historical study pursues these questions as it examines fascinating source material—writings by African patients in these institutions and the reports of officials, doctors, and others—to discuss the meaning of madness in Nigeria, the development of colonial psychiatry, and the connections between them. Jonathan Sadowsky's well-argued, concise study provides important new insights into the designation of madness across cultural and political frontiers. 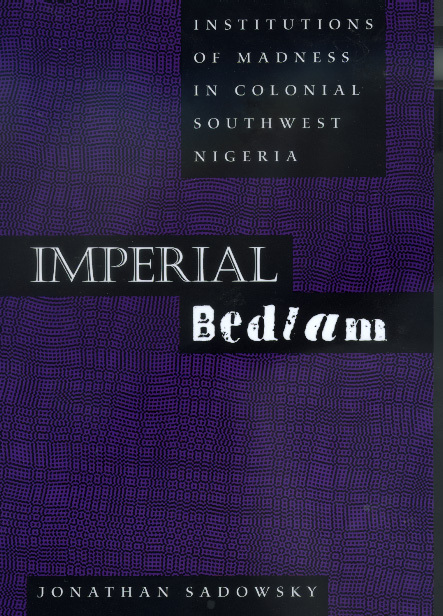 Imperial Bedlam follows the development of insane asylums from their origins in the nineteenth century to innovative treatment programs developed by Nigerian physicians during the transition to independence. Special attention is given to the writings of those considered "lunatics," a perspective relatively neglected in previous studies of psychiatric institutions in Africa and most other parts of the world. Imperial Bedlam shows how contradictions inherent in colonialism were articulated in both asylum policy and psychiatric theory. It argues that the processes of confinement, the labeling of insanity, and the symptoms of those so labeled reflected not only cultural difference but also political divides embedded in the colonial situation. Imperial Bedlam thus emphasizes not only the cultural background to madness but also its political and experiential dimensions. Jonathan Sadowsky is Assistant Professor of History at Case Western Reserve University.